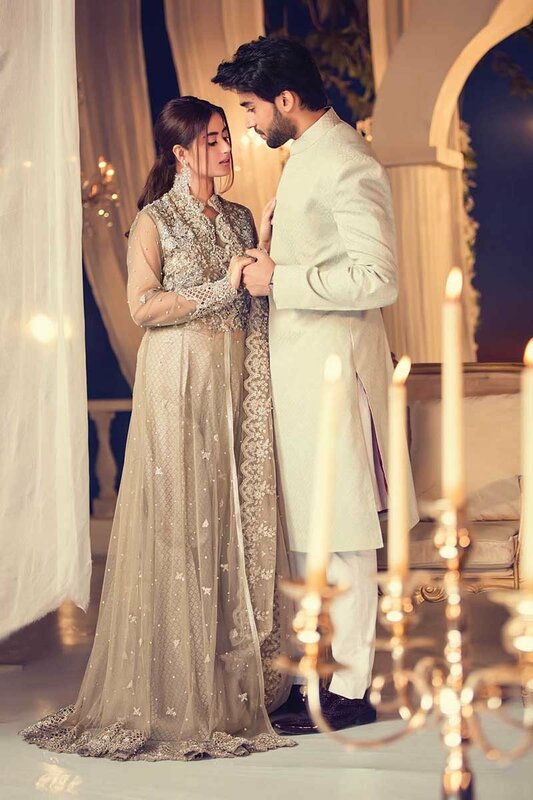 Wedding season is at its peak and designers are busy in launching their formal collections. One of the most famous Pakistani Designer having a prominent name is Maria B. She has started her own fashion house after getting diploma from National school of Arts Lahore.In such a few intervals of time she got remarkable feed back from her customers.Her work is so marvelous in designing clothes for women. She has presents its many collections including seasonal (Summer, Winter/Fall, Midsummer) as well as festive. 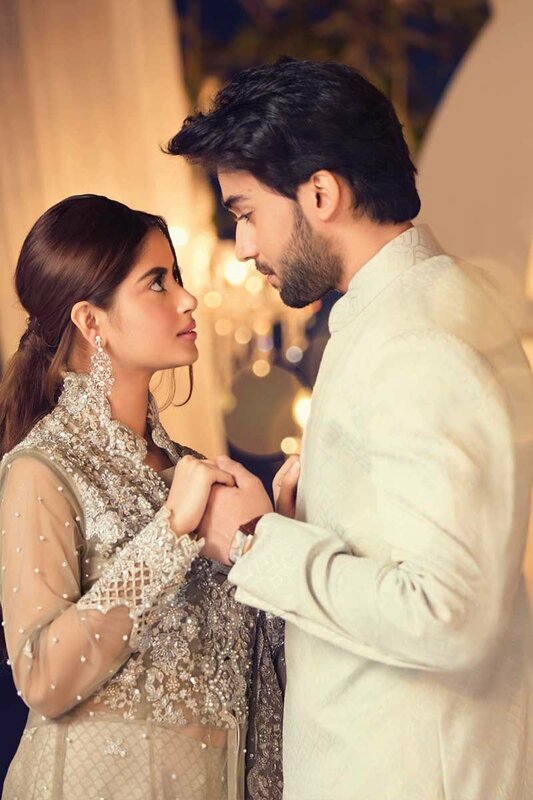 Today we will share the Maria B Couture Latest Fancy Formal Wedding Dresses Collection 2019. 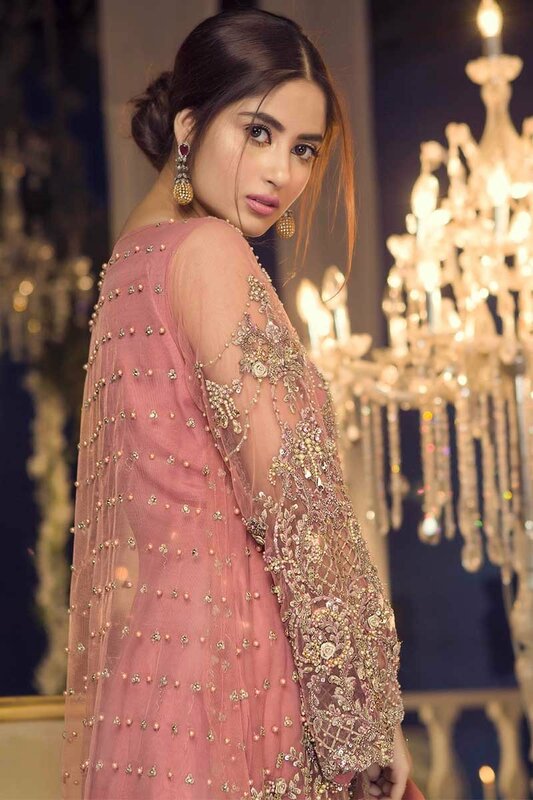 Recently she has launched her Couture Collection named “Maria B Couture” containing adorable formal wedding wear dresses. That is totally different from the previous one, as it contains many new varieties of embroidered shirts, Sarees, gowns, Frocks, etc. These Dresses are super best for your bestie’s, relative or sibling wedding events. You will the hot couple in the shoot. 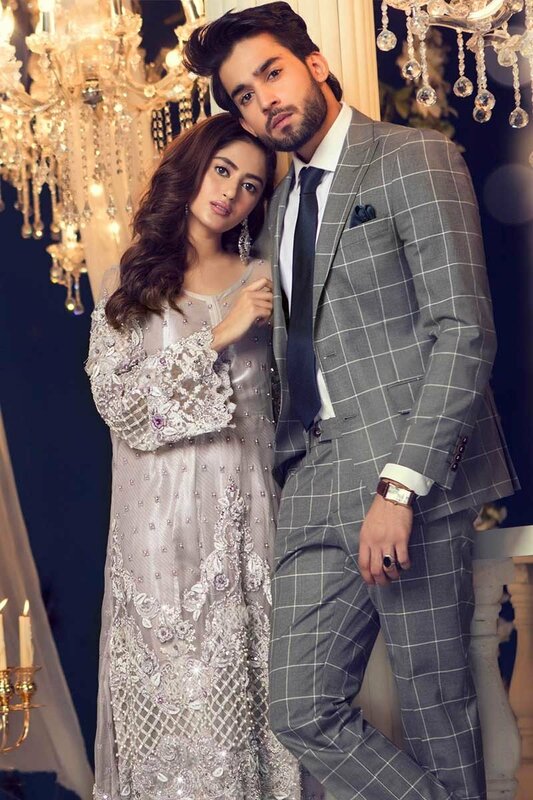 Sajal Aly and Bilal Abbas Khan pair together for the latest shoot of Maria B Couture Collection 2019. If you have wedding nearby then no need to worry about the dress to wear. 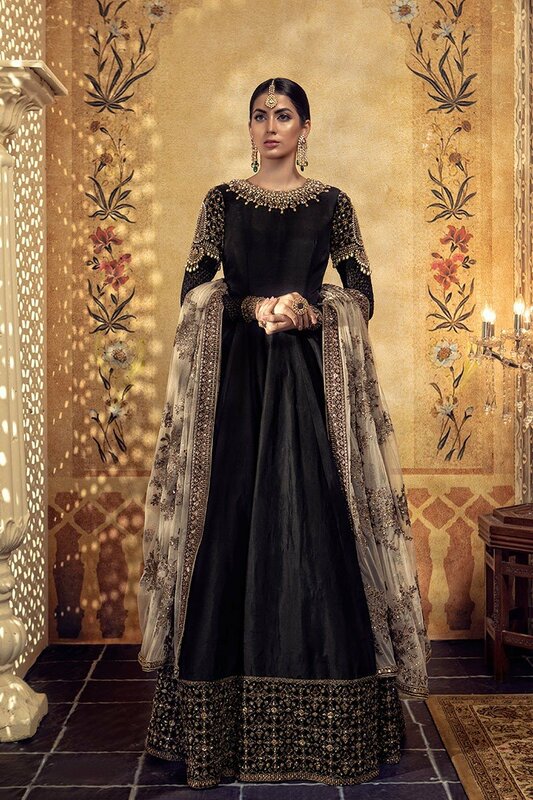 Because this collection is all about the perfect wedding wear attires. The luxurious front open shirt and maxi has taken our hearts. It always goes great with a smooth makeover and high heels. 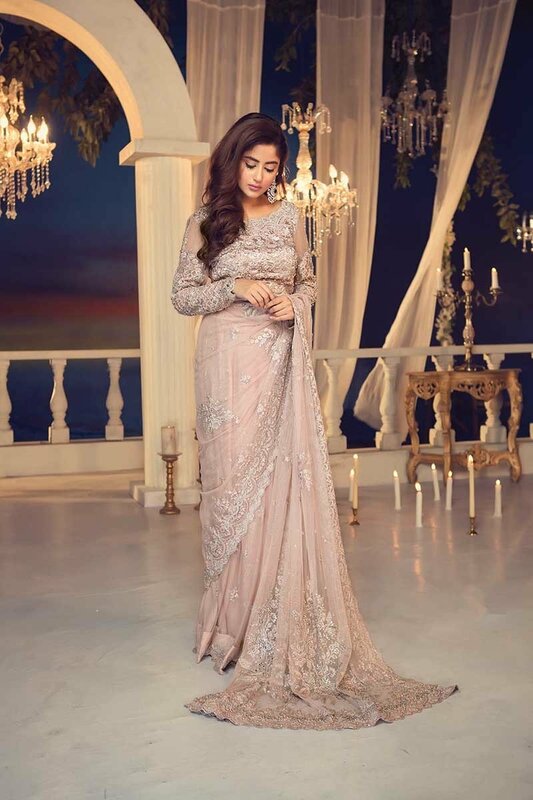 In Today’s post, i am presenting some of the delicate shots that are featured in Maria B Couture Latest Fancy Formal Wedding Dresses 2019 and modelled by sizzling Sajal Aly. The Dresses are made to order. You have to order them and it will require at least four weeks to complete. 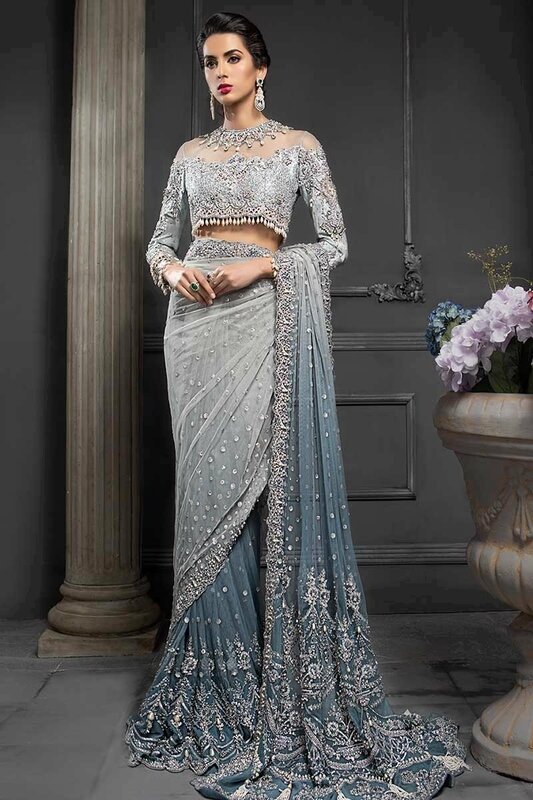 The delicate embroidery at front and some at neckline, some have traditional stonework and dabka work so they are extraordinary for formal functions. The jaal embroidery work with embedded stones and pearls looks so appealing. The A-line shirts are paired with traditional gharara pants and straight trousers. The long maxi gowns are best for an evening function. These Maria B Couture Latest Fancy Formal Wedding Dresses are now available to order. 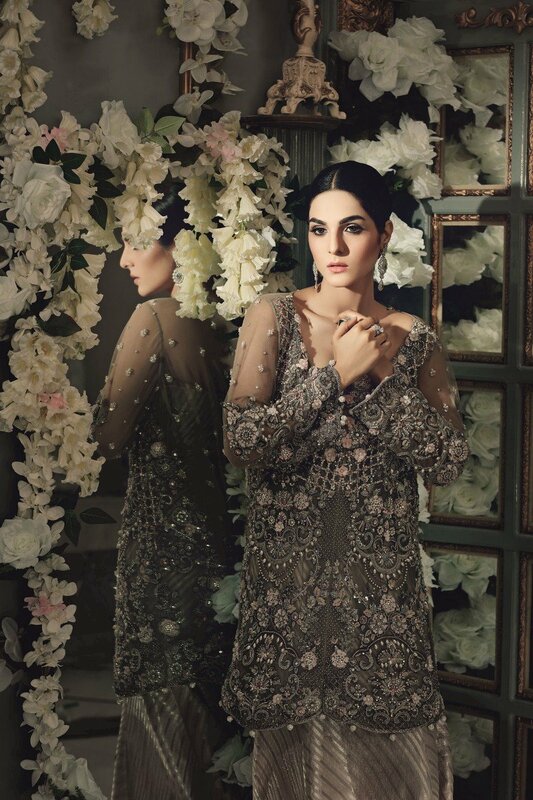 So be the first to wear the awesome dress by Pakistan’s no one designer among your family and relatives. Go and grab your choice and make your functions more beautiful and special. The Pictures below are some of the Selective shots of this collection.